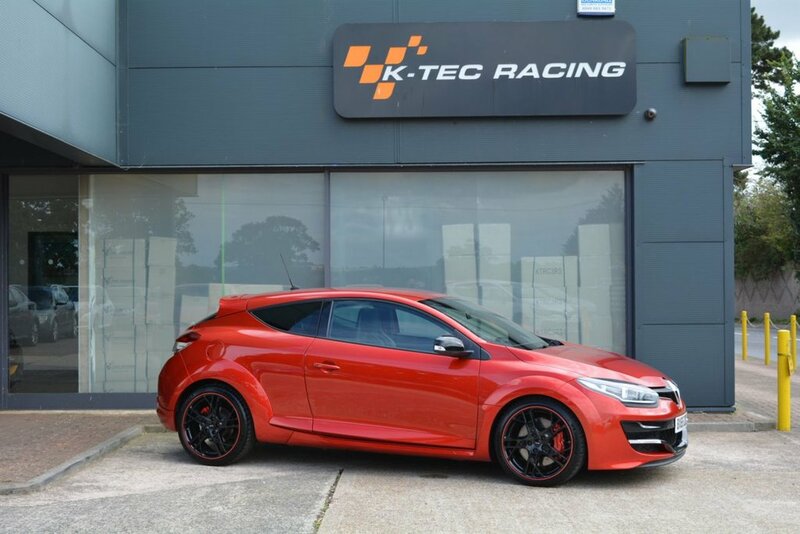 This stunning Megane 275 Cup-S is presented in the amazing Flame Red with gloss black 19" Steev alloys complete with red pin stripe. It boasts a superb specification which includes a full leather interior with Recaro seats, Cup chassis, Ohlins coilover suspension, Akrapovic titanium exhaust with carbon tailpipe, V2 RS monitor with sat nav, alcantara handbrake and gear lever boots and day time running lights with xenon headlights. Other standard specification includes electric windows/mirrors, stereo with bluetooth connectivity and USB port, trip computer, rear parking sensors, sport button, air conditioning and cruise control. As with all our approved used cars it will have passed our thorough workshop inspection before going to its new owner who will also benefit from the remainder of the manufacturer warranty until September 2019. Supplied with a full service history and it is MOT'd until August 2019. Free self adjusting finance calculator available on request, just email us for a free no obligation quote. Fully tailored low rate finance packages available with low deposit and up to 5 year term. Warranty extension from our standard 6 months to 15 months from just £149, please contact us for more information. All cars Experian Auto Check clear.